A new ranking of colleges and universities has placed Ithaca College in the #13 spot in the country for student engagement — a measure of teaching quality that considers how well the college manages to inform, inspire and challenge its students. A joint project of The Wall Street Journal and Times Higher Education, the ranking assessed more than 1,000 colleges and universities across the United States. The rankings used 15 individual performance indicators across four broad categories — engagement, resources, outcome and environment — to create an overall score that reflects the broad strength of the institution. Ithaca was the highest-scoring college or university in New York State for engagement. Institutions joining IC in the top 20 include the University of Pennsylvania, Swarthmore, Michigan State and Baylor. Whether teaching is challenging, supports critical thinking skills and enables students to apply their learning to the real world. The level of interaction between students and faculty. Whether students would recommend their institution to a friend. Times Higher Education captured data on student engagement through its annual U.S. Student Survey, carried out in partnership with two leading market research providers. The survey gathered the views of more than 100,000 current students on a range of issues relating directly to their experience at college, including students’ engagement with their studies, their interaction with their teachers and their satisfaction with their experience. Overall, Ithaca College placed at #194 in the country among the 1,000 institutions included in the rankings. The London-based Times Higher Education has annually published its World University Rankings since 2004. 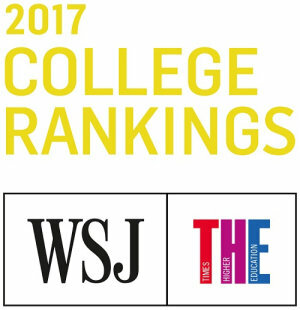 This year it partnered with The Wall St. Journal to create the U.S. College Rankings, which can be found online at www.timeshighereducation.com.